Made of good quality clear rubber material, durable and flexible. The door & drawer cabinet furniture bumpers can serve for a long time. Soft, clear self-adhesive protectors will quickly and easily attach to any surface for non-slip, scratch-proof furniture Protection from abrasion, vibration, shock and noise. Self-adhesive backing, strong, water-proof and no traces left. Please make sure the surface you apply is clean and dry night applying. Be careful not to touch the adhesive side when applying. Do not touch or move them immediately after applying, wait for them to stick tightly. 1. You need to stay away from children in unused situations. 2. Don't touch or strip off immediately until it sticks tightly. 3. One-time use is recommended, pad's stickiness would fade if recycle used. 4. Please keep object's surface clean before sticking self adhesive rubber pads, or it would abate pad's stickiness. Material - Made of rubber, soft and easy to peel off without any trace, can effectively reduce the noise of impact, impact and closure. 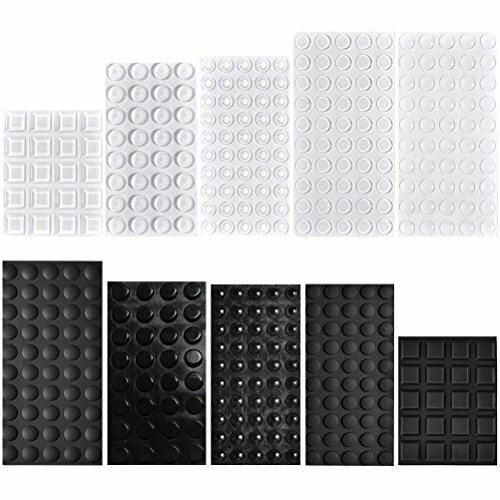 Self-adhesive - Black and transparent rubber foot with self-adhesive, easy to paste on the items you want to protect. Function - reduces noise due to shutoff, impact, slamming and violent vibration, buffering and anti-skid, protecting furniture from sliding down. Versatility - can prevent hard surface scratches, impact or reduce friction, apply to the table, desk, gate, railing, drawer, cabinet, or other need to buffer the furniture, and household supplies necessary. Warm tips - for better work, please do not touch the adhesive surface before pasting, and please keep the pasting position, the rubber foot clean. If you have any questions about this product by QIUYE, contact us by completing and submitting the form below. If you are looking for a specif part number, please include it with your message.